The part BBa_K2205017 was designed as Reporter unit of the Sensynova multicellular framework for biosensors development (Figure 1). This part was made to test the modularity of the system by replacing the sfGFP reporter module of the Sensynova platform design with the chromoprotein variants amajLime (BBa_ K1033915). The amajLime protein is a yellow-green chromoprotein extracted from the coral Anemonia majano. It was first extracted and characterized by Matz et al. under the name amFP486 (UniProtKB/Swiss-Prot: Q9U6Y6.1 GI: 56749103 GenBank: AF168421.1) and codon optimized for E coliby Genscript. The protein has an absorption maximum at 458 nm giving it a yellow-green colour visible to the naked eye. The part BBa_ K1033915 is under the control of our connector 2, part BBa_K2205013, meaning it is normally repressed except in the presence of connector 2 (C12 – RHL). Initial testing of this chromoprotein reporter variant was conducted by inoculating 1ml of LB containing the antibiotic Chloramphenicol with a colony from each colour proven by colony PCR and sequencing data to be correct and grown at 37° for 2 hours as well as a control of wildtype DH5α. 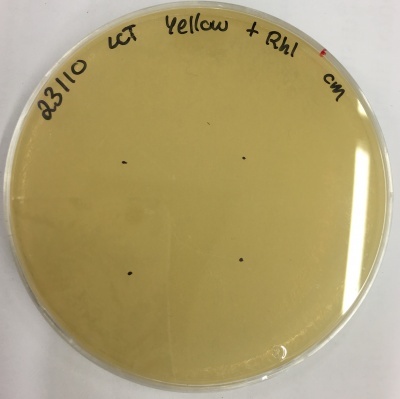 Cultures were then plated onto a LB agar + Chloramphenicol plate which were then innoculated in four locations with 10μl of connector 2 (C12 - Rhl) and grown overnight resulting in the picture below. Matz, M., Fradkov, A., Labas, Y., Savitsky, A., Zaraisky, A., Markelov, M. and Lukyanov, S. (1999). Nature Biotechnology, 17(10), pp.969-973.